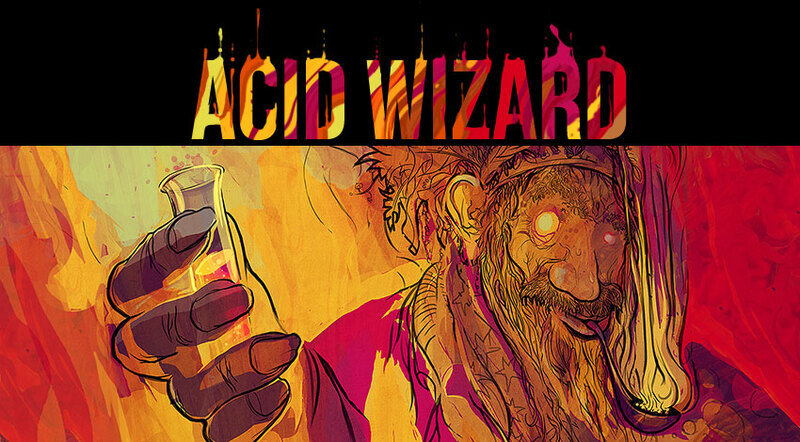 – CHAPTER TWO! That’s right, a whole new world for you to explore. – Chapter 1 is mostly the same, although it has been rebalanced somewhat. – Get ready to get your feet wet – a new Swamp biome! – Around a half a dozen of new NPCs! – New enemies, with more varied and advanced behaviour! – New traps, items and weapons! – You can skip right to Chapter 2 if you have a save file from a previous alpha where you completed the first chapter (it will be displayed in green in the profiles menu). BUT you will skip some content from the ending of Chapter 1… so it’s your call. – I’ve put a lot of effort to optimize memory and garbage collection, so I hope any out-of-memory crashes are a thing of the past! Additionally, this should help a lot with people with low-end CPUs with stuttering problems. – You can disable the gamepad mode entirely in the control options if it interferes with your setup. – The Epilogue will probably be unavailable until the final release. Even though we’ve tested this update pretty heavily, it was impossible to catch and fix all the bugs given the size of the changes, so please bear with us! There is some content that did not make it into this update, but for now we will focus on fixing any non-minor bugs we find. 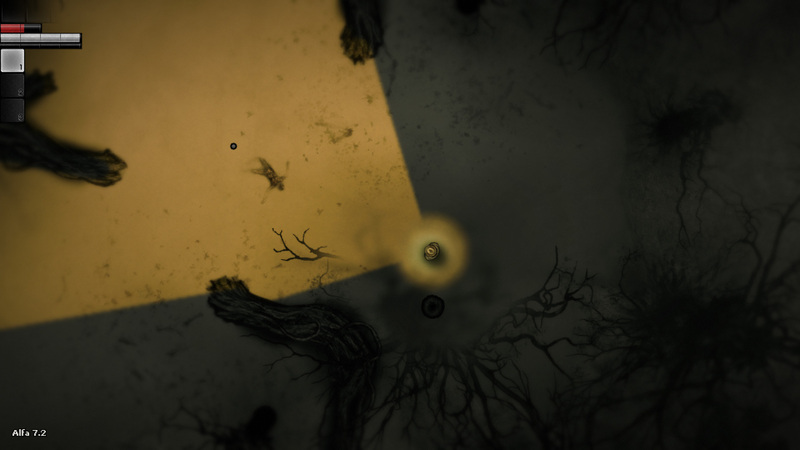 We are slowly nearing the end of development, so if you’ve already played some of Darkwood, we strongly advise you wait until the final release so you don’t burn yourself out. I’d like to thank all the testers who helped out during the last few weeks of huntings for bugs: ShadyS, FireRage259, DeforMC and SDF121! Much love guys! In the meantime, we will be visiting streams and watching gameplay footage from you guys! 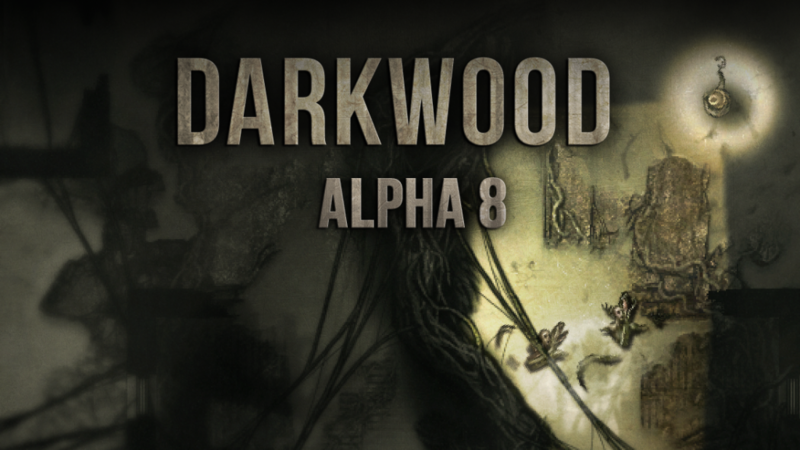 It has been some time since we have updated Darkwood. So long that some of you have been raising concerns about the game being abandoned, us being eaten by a Chomper or other horrible thing. Let me put these fears to rest, dear Mortal! 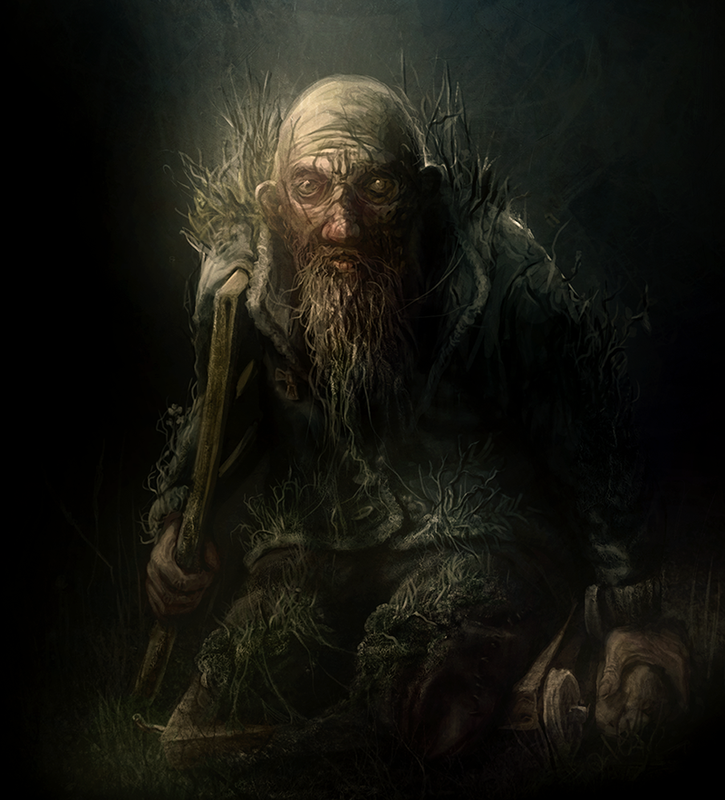 Darkwood is alive and well, although we admit that development is very slow, but please know we are putting all the energy and passion we have into this project! This means a new biome, locations, NPCs, enemies, items, objects and mechanics! Stuff that explodes, new uses for the shovel, rebuilding parts of your hideout and more! There are unique dangers hiding beneath the surface of the many lakes littered around this biome. Traversing water will require a different approach than walking on solid ground. There is also a dense fog, which appears from time to time. You can expect to encounter various uses of this mechanic, including chain traps or things that crawl on the ground and try to catch and immobilise you. The enemies introduced in this update use more advanced tactics than the existing ones. This includes submerging underwater or underground, surrounding movement and sideways dodging, and reacting to your field of view. I’ve spent a lot of time on optimizing performance and memory usage. 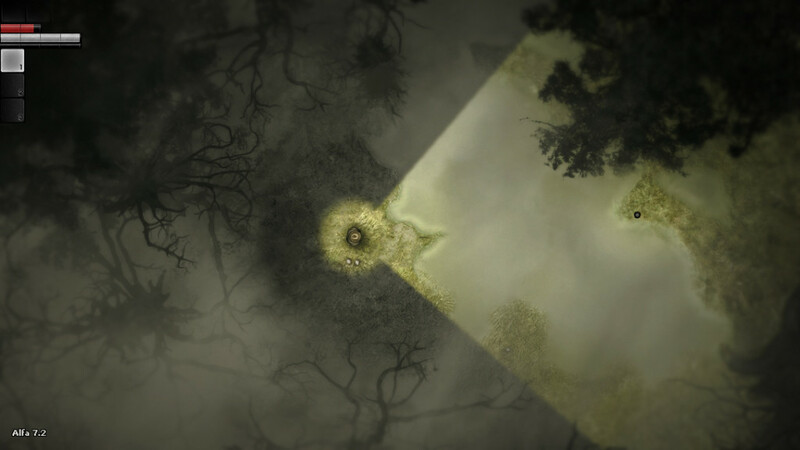 In particular, in previous versions of Darkwood, the lighting system could cause occasional stuttering due to memory allocation, but no more in the next alpha! There are a ton of other changes big and small that will make it into the new alpha. There is no set date when we expect it to release, so please be patient with us! Get ready for another update to Alpha 7! This update mostly focuses on fixes and minor new features. – Some furniture is now destructible! – In gamepad mode, selecting items is now easier. Furthermore, if you are not aiming anywhere, the nearest item close to you will be automatically selected. – The game now saves when entering a location outside of the forest, before a dream, and when starting the second part of the prologue. – Added Prologue and Chapter 1 messages. – You can now dodge when having any item equipped, not only melee weapons. – After a new day, a fullscreen message appears notifying about it, instead of a text message on the bottom of the screen. – Added camera shake and some new doctor animations to prologue. – Updated flashing stamina bar when not having enough stamina to do something. – Notifier messages, like when discovering a new location, have been also updated. – Added a notifier when you receive reputation with someone. – Fixed characters getting stuck in cornfields. – Having a flashlight no longer makes you fully safe from Shadows. – New pixelation shader for some stuff. – Items and doors now receive force when being shot. – When you die and drop your inventory in a location outside of the forest, you will now see a icon on the map indicating the entrance to that location. – After dying, your respawn area will be cleared of stuff that can be dangerous to you, like infection or traps. – You can’t travel through the hole to the village during the night anymore. – Wolf now marks his camps on your map, as opposed to giving directions. – The Three no longer sell welders and toolboxes. – Changed light disable time by Banshee scream. – Added option to turn pages in the notes part of the journal. – Audio filters like low pass now tween nicely. – Less stamina drain when running on roads. – Fixed exploit with characters that are eating something. – Fixed wood logs blocking a door in the village. – Fixed some weird dialogue or locking out the player from continuing the story when murdering NPCs in certain sequences. – Fixed pigshed lever not working in some cases. – Fixed being able to use the pigshed lever when the generator turned itself off when ran out of juice. – Removed discover popup from hideout 1. – Added stamina bar flash when dodging and not having enough stamina. – Hopefully fixed a door glitch making it stuck. – Fixes to particles not playing correctly. – Fixes to enemy health bars not updating sometimes when being hit. – Fixes to weird enemy behaviour when you are in their line of sight, but they have no way of getting to you. – Fixed pathfinding sometimes not updating correctly. – Fixed message when going to main menu. – Fixed message when trying to quit in prologue. – Fixed villager with torch not emitting light. – Performance and memory improvements with characters not being culled correctly. – Fixed being able to pick up items which are hidden behind the crafting menu. – Bullet shot particles now display in the correct impact place. – Fixed incorrect molotov spawn point when throwing. – Fixed being able to hear weird sounds when generating world / loading game. – Roads in the village no longer block some furniture. – Wolf no longer appears for no reason when you have died during the second night. – Fixed some dream locations and their pathfinding not removing itself properly. – Fixed exploit when repairing multiple items at a time. – Fixed villager in border cottage talking when you’ve already killed him. – Fixed item name sometimes not following the cursor. – Fixed positioning of some objects being under / over the player incorrectly. – Fixed displaying unnecessary controls in Control Menu. – Fixed controls mask in Control Menu. – Normalized item mass and drag values to be consistent. – Fixed spiders being able to spawn inside walls in some cases. – Many fixes to cutscene sequences after failing / winning doctor’s dream and loading the game immediately afterwards. – Fixed having to select item again when you have it selected in your hotbar and repair it. – Fixed characters appearing on top of stuff like tents for no apparent reason. – Fixed incorrect FOV when in cutscenes. – Fixed padlock state not saving in some story-related objects. – Fixed big objects like tree clusters spawning on top of roads. – Fixed many ways to troll the villagers in the pigsheds. – Fixed trees spawning on top of bushes. – Fixed readability of player spoken messages (last word would be sent to a new line mid-word). – Fixed pitchfork getting stuck mid-air when destroying a door. – Fixed weird door in pigsheds. – Fixed the passage to doctor’s house not opening itself after attaining the doctor’s directions. – Fixed different layouts of the underground well not appearing correctly. – Fixed weird Antek behaviour. – Fixed pigshed lever sounds sometimes playing twice. – Added a notifier when selecting the cut cables, when the generator is running. – Fixed using the pigshed lever when the mother sow is already dead. – Fixed broken light sparks sometimes displaying incorrectly. – Fixed porter sometimes getting stuck in time and space. – Fixed summoned dogs spawning inside places which they can’t get out of. – Fixed some characters getting resurrected in the village. – Fixed weird gap in journal keys. – Fixed smoke in burned house in village . – Fixed being able to get behind characters doing idle animations and pushing them around. – Fixed missing Linux cursor. – Fixed dog summon animation incorrectly displaying. Also, modified the summon time. – Fixed pigs and chickens sometimes disappearing in the village. – Fixed gasoline spill animation getting stuck in place sometimes. – Fixed life counter getting overlapped by health bar. – Fixed some events / area effects not being applied properly when loading a game and player is inside that area. – Fixed some tree clusters getting broken on game load and being inconsistent with other trees. – Fixed lag when getting hit or walking into a poison mushroom for the first time. – Some story related doors / windows are unbarricadable now. – Prologue dream now ends on first hit by chomper, not when dying. – Fixed time not displaying correctly when loading game in village. – Fixed some weird things happening when dying just before daytime. – Fixed some musican bugs, like not playing the violin or not wanting to run away. – Fixed player being in the wrong place when loading a game when exited the well underground. – Fixed camera shake being overriden with a shake of a smaller magnitude. – Fixed cut off chomper scream in well underground. – Fixed tractor having a health bar even though the musician got out from under it in some cases. – Fixed some culling problems when traveling between outside locations, resulting in poor performance. – Fixed being able to see the journal when in second part of prologue. – Fixed infections having bad object ID’s sometimes. – Fixed some pathfinding issues for characters, resulting in playing their idle animations in wrong places sometimes. – Fixed some objects sprites being reverted to their undestroyed version on game load. – Fixed empty bottle in player hands rendered as a piece of meat. – Fixed redneck being bigger when playing his draw animation. – Fixed error when a character would try to mark something on your map if you’ve never opened it before. – Removed double footstep sounds for shotguns. – Fixed occurences where enemy corpses would disappear under some sprites. – Fixed redneck who is burying himself trying to play a animation he does not have. – Removed duplicate electronic game. – Fixed some objects not having colliders. – Fixed dialogue freeze when talking in doctor in underground entrance after a won dream. – Fixed possibility of Doctor freezing after being hit. – Fixed trainwreck trap music reappearing after a loaded game or when reentering this location. – Fixed weird menu glitch when having the game minimized in the main menu for some time and then returning to it.